complimentary strategy session to see how this program can help support your business goals. As a leader, you know the value of developing coaching skills. 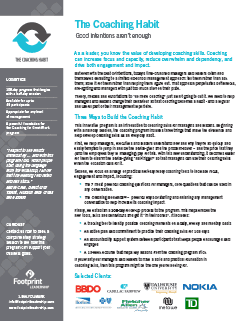 Coaching can increase focus and capacity, reduce overwhelm and dependency, and drive both engagement and impact. But even with the best of intentions, today’s time-crunched managers and leaders often find themselves defaulting to a limited old-school management approach: tell them rather than ask them; solve it for them rather than helping them figure out. That approach perpetuates bottlenecks, fire-fighting and managers with just too much stuff on their plate. Theory, models and exhortations to “do more coaching” just aren’t going to cut it. We need to help managers and leaders change their behaviour so that coaching becomes a habit - and a regular and useful part of their management repertoire. 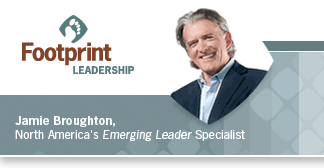 This innovative program is an introduction to coaching skills for managers and leaders. Beginning with a half-day session, the coaching program includes three things that make the difference and help develop coaching skills as an everyday habit. First, we help managers, executives and leaders understand how and why they’re so quickly and easily tempted to jump in and be the advice-giver and the problem-solver – and the price that they (and the employees they’re managing) pay for this. With this new understanding, it becomes easier for them to disarm the advice-giving “hair-trigger” so that managers can use their coaching skills when the occasion calls for it. The 7 most powerful coaching questions for managers, core questions that can be used in any conversation. The Coaching Bookends™ – powerful ways of starting and finishing any management conversation to help increase its coaching impact. If you want your managers and leaders to have a solid and practical foundation in coaching skills, then this program might be the one you’re looking for.